We've had a great run over the last two years, and it's been amazing for a show that started out as a happy accident to run for so long, to have so many amazing folks grace the mic . Thank you to every single guest, guest host and fan of the show. Thank you to everyone who's said a kind word about the show after the announcement came out about Tokens ending. The show might be ending, but the episodes will remain on Simplecast, archived. We'll leave Fresh Out of Tokens merch up in the I Need Diverse Games spreadshirt shop, and the twitter will be here even if it serves as more of an archive. Thank you to everyone who listened, who took a chance on a fledgling show to come on and be a guest, or promoted the show, or talked us up on twitter, Facebook or anywhere else. Special thanks to Shareef Jackson for rocking out with a Tokens mug early on. 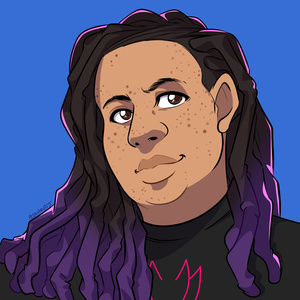 Don't be strangers, keep up with our outgoing EIC on twitter, tumblr, facebook, and her site; if you got a little coin to spare; Tanya is on Patreon to keep doing I Need Diverse Games as a full time gig. Also! Check out these other shows that are doing amazing work and having some great conversations.